article titled “Beatlemania.” Her sentiment holds up nearly 50 years later as a succinct summary of the Beatles Effect. Considering it was published four days before John F. Kennedy was killed, it is all the more powerful now. Being as it turns out the very pinnacle of rock ‘n’ roll, Beatles music remains “effective” in both the watching and hearing. This is due not only to the genius of the music, but the joy, excitement and hope exuded by the songs and the Beatles themselves – qualities we hunger for at least as much now as we did then. Their continuing cross-generational appeal comes home to me in a short course I teach called “Love is All, Love is You: The Spirituality of the Beatles,” most recently at the Dominican Center at Marywood and beginning Feb. 28 at the Calvin College CALL program. The Marywood class includes two fathers and their teenage children, who seemed as keenly engaged in the subject matter as their parents. Others marveled at Paul’s performance of “Yesterday,” the regretful ballad recorded two months after “Help!” — twin expressions of vulnerability by two maturing men. “I long for yesterday” takes on deeper resonance for those of use who have piled up many yesterdays since then. But it’s the exuberance of the band that captivates with a freshness of spirit hard to imagine being possible now. The business-like Sullivan clearly has been charmed by the boys by this time, introducing them singly beforehand and afterward congratulating them on handling themselves “magnificently.” “Well come on, let’s hear it for ‘em!” he implores the screaming girls. They scream for all of us who long for joy and hope delivered through thrashing guitars and gorgeous harmonies. The Beatles’ faces are streaming with sweat, their vocals dead-on and their instrumentals near-flawless in the face of this 747-level noise. Their cheerful energy defies the darkness of the times, then as now, even with all the darkness we know is to come in their own lives. 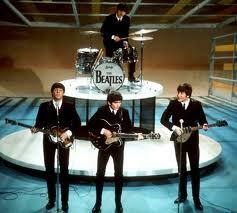 Beatles music still represents those longings. Despite the darker strains that would later imbue their songs, the body of their work speaks to the best in us. Theirs is a vision of joy linked to the power of the mind, inviting us to imagine a different kind of world. Have you heard? The word is love. This is the name? Love is All, Love is New: The Spirituality of the Beatles ? Sorry, that was a typo. Thank you for pointing it out! This course offers a great perspective on the spirtual side of the Beatles’ influence on not only the 60’s generation but all generations which followed. For so many people, mentioning the word “spirituality” in the same sentence as “the Beales” only brings up either their time in India, or, the much mis-understood quote from John when he said they were more popular than Jesus, which brought on a slew of record-burnings, fueled by overly zealous preachers of the day. Thanks Charles for taking the time to help us hear the Beatles afresh for times like these.